Mon. 16: Meeting with Susana Nahoe at CONAF. Preparation of equipment and materials and visit to Rano Raraku (CAP, CF). Tue. 17: In the morning, meeting with Governor Carmen Cardinali and council members (MB, CAP, RPR, CF). In the afternoon, carrying of equipment and materials to the site, installation of platforms and ladder, retrieval of the buried ‘toki’ and training of RPR on the operation of the handheld XRF spectrometer (MB, CAP, RPR, CF). Wed. 18 – Sat. 21: Field work in Rano Raraku: application of the protective treatment (MB, CF, CAP) and analysis of about 170 ‘toki’ with the portable XRF (RPR, VTH, CF). Mon. 23: Cleaning of the site and removal of equipment and materials (CAP, CF). Tue. 24: Collection of XRF data on basalt fragments embedded in the statues, basalt outcrops and ancient quarries around Rana Raraku and Tongariki and along the north coast between Poike and Anakena (CF, CAP). Wed. 25: Collection of XRF data on basalt outcrops and ancient quarries along the south coast between Maunga Toa Toa and Maunga Orito (CF, CAP). The vandalism act perpetrated against the site in April 2010 has required a profound revision of the original project’s planning. Although the decision was taken to continue with the project, the methodology initially implemented for the conservation treatment needed to be reconsidered due to the budgetary, technical and timing constraints created by this regrettable event. After a careful evaluation of the different options, it was decided to limit the conservation treatment to the application of a protective treatment as water remains the major factor responsible for the deterioration of the statues. Such an approach also permitted to proceed with minimal equipment for the application, using only a ladder without having to put back a bulky scaffolding (fig. 1). From a technical point of view, this choice obviously represents a compromise with all the uncertainties and limitations attached to it. On the other hand, in term of feasibility, this approach is much closer to a methodology, this pilot conservation project will contribute to define, that could be applied at a larger scale, e.g. to complete the treatment of a large number of statues in a relatively short time frame and at a reasonable cost, a final objective which should remain a priority for the preservation of the statues on the island. Figure 1: Conservation intervention and application of the protective treatment (photographs by VTH). The conservation intervention has consisted in the application of a protective treatment using a silicone concentrate of silane and siloxane (BS290, Wacker) diluted in a solvent, similar to white-spirit though less pure but available in Chile, containing a mixture of paraffinic, olefinic, cyclo-paraffinic and aromatic C10-C14 hydrocarbons (Aguarras Mineral). BS290-based water-repellent solutions were successfully used in the past for the treatment of the Hanga Kio’e and Tongariki statues (Roth, 1990; Bahamondez and Valenzuela, 2004). – A solution of BS290 at a concentration of 15% (V/V) diluted with Aguarras Mineral. – Cave Clear-S: a ready to use solvent-based water repellent available in Chile (the product actually contains BS290 diluted with Aguarras Mineral). After some preliminary trials with the brush, the different products were applied with a portable sprayer following a wet-on-wet application methodology until saturation of the surface was observed. The water-repellent solution at 15% was primarily used for the treatment of the exposed, and most weathered, parts of the statues. Once treated with the solution at 15%, the surface was sprayed with pure solvent in order to increase the penetration depth of the active product followed by a final application of Cave Clear-S. On the excavated parts of the two statues which are in much better condition, only Cave Clear-S was applied. On the back of the head of statue RR-001-157 which has suffered major losses of tuff material through flaking, a pointing mortar, prepared by mixing a partially reacted ethyl silicate with a fine powder of yellowish volcanic tuff, was applied in some areas along the edges created by these losses. On the backside of both statues, a few loose surface fragments were also reattached with Paraloid B-72. These relatively elevated values are directly correlated with the high absorbing capacity of the weathered volcanic tuff, a material for which the porosity can reach 40% and more. The high consumption per square meter also indicates, indirectly, that the treatment was carried out to a sufficient depth with respect to the thickness of the weathering layer which can be estimated to a few centimeters. However, important variations in the absorbed amounts were observed during the application, primarily caused by the petro-physical heterogeneity of the volcanic tuff (e.g. between the fine and coarse-grained layers) as well as by differences in the degree of weathering (e.g. strongly weathered areas on the top of the heads, whitish hydrated silica crusts with low porosity). Although the solvent evaporation and drying of the statues will take several weeks or even months, after the application of the water repellent products, the effectiveness of the protective treatment was almost immediately visible with water droplets literally running away from the treated surfaces when water was poured onto the statues. Finally, it should be mentioned that the weather conditions during the mission, though not bad, were far from being optimal, with time to time strong winds and light rains that some days notably complicated the conservation treatment. For the completion of the conservation work, the last phase of intervention is planned for December 2011 or January 2012 and will primarily consist in a general assessment of the situation after the statues were left to dry and stabilize for several months, the removal of the remaining lichens and algae’s and other cleaning actions, color retouching and adjustments and, if necessary, additional treatment of the areas previously colonized by the lichens. The decay on the back of the head of statue RR-001-156 is important and particularly visible in the lower proper right part that shows major losses of material (fig. 2). The upper part is apparently in much better condition, but the hollow sound produced by knocking the surface has indicated that this area is also affected, with a real risk of losing a large and thick piece of tuff by detachment, something that could happen anytime. Obviously, this structural problem is the result of an advanced weathering stage, but has been also enhanced by the orientation of the natural bedding in the tuff, slightly inclined with respect to the vertical position of the statue, creating thus potential planes of de-cohesion (fig. 2). Besides, on some statues located on the external slopes of Rano Raraku, the same causes have already led to a complete loss of the back of the head. From a conservation point of view, a possible solution would be to secure the area at risk by inserting two or three stainless steel pins fixed with epoxy glue. However, following discussions with other experts about the appropriate methodology, it has been suggested that such an intervention, though relatively easy to implement, would benefit from a detailed and quantified assessment of the extension of the damage and it has finally been decided, for now, to postpone the conservation intervention. A precise picture of the spatial distribution and size of the voids underneath the surface could be obtained by analyzing the area with a ground penetrating radar unit (GPR) equipped with a high frequency antenna and the possibility to carry out GPR measurements will be explored for the next mission. Figure 2: Decay on the back of the head of statue RR-001-156 and schematic visualization of the area sounding hollow (dotted circle) and of the bedding planes (arrows). Photographs by CF. The goal of this project is to use the ‘toki’ collection previously excavated and fully described by EISP as the core of an intensive scientific analysis and sourcing study. More importantly, this project provides also a unique opportunity for Rafael Paoa Rapu to be involved in a scientific study using a state-of-the-art portable XRF instrument and to further develop his interest and expertise in lithic analysis. For this purpose, a technical and safety training on the operation and handling of the XRF instrument (Niton XL3t 980 GOLDD+) was given to Rafael by C. Fischer. During the excavation of statue RR-001-157, more than 300 ‘toki’ and ‘toki’ fragments were found and subsequently reburied in a one meter deep hole in square 30 for storage (Van Tilburg and Arévalo Pakarati, 2010). The first task was to retrieve the ‘toki’ and to clean them thoroughly with water, at least the surface to be analyzed, to minimize errors in the XRF readings due to contamination by soil deposits. Although the ‘toki’ were fully documented after the excavation, in order to avoid an on-site time consuming identification and matching procedure, each ‘toki’ was again photographed, measured and labeled with a reference number also used for the XRF data file. Vaiheri Tuki Haoa joined the team to help on these tasks allowing Rafael to focus on the XRF measurements (fig. 3). Thanks to their dedication and patience, about 170 ‘toki’ could be analyzed during this field season. Figure 3: Documentation and XRF analysis of the ‘toki’ by Rafael and Vaiheri (Photographs by CF). A preliminary analysis of the data collected with the portable XRF has shown that elements such as Zr, Ca, K, Rb and Ti are particularly interesting to investigate compositional variations among the ‘toki’. For example, on a bivariate plot of Zr vs. Ca (fig. 4), it can be observed that most data form a well-defined cluster with intermediate Zr and Ca values indicating that about 85% of the analyzed ‘toki’ are made with the same type of basalt. Another cluster, representing about 13% of the ‘toki’, with low Ca and high Zr can also be distinguished while only a few artifacts belong to a group with high Ca and low Zr. Moreover, the comparison of the Zr values with previously published geochemical data (Baker et al., 1974) suggests that the basalt of the ‘toki’ from the main group is a mugearite; a result in agreement with earlier analyses carried out on a few ‘toki’ (Baker, 1993). The second cluster with a higher Zr content corresponds most likely to a benmoreite whereas the low-Zr basalt could be either an alkalic basalt or a hawaiite. In general, the concentration variations observed for Zr and Ca and other elements are consistent with the increasing differentiation index (e.g. from alkalic basalts to benmoreites) that characterizes the numerous lava flows associated with late eruptive phases of the Terevaka volcano (Vezzoli and Acocella, 2009). 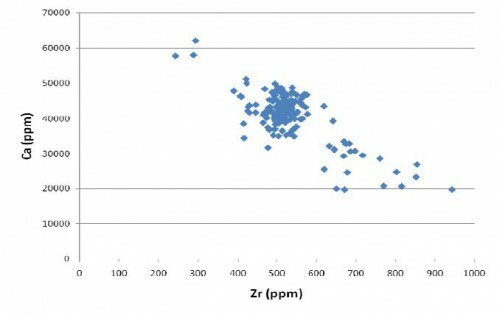 Figure 4: Bivariate plot of Zircon vs. Calcium concentrations in 168 ‘toki’ analyzed with the portable XRF. For the identification of potential raw material sources, additional XRF measurements were taken on some of the volcanic rocks found on the island. This first field survey has included the analysis on several statues of basalt fragments embedded in the volcanic tuff as well as the analysis of lava flows and ancient known quarrying sites located on the south and north coast’s of the island (fig. 5). The field data need still to be processed and will be compared with the ones obtained for the ‘toki’. It is expected that the interpretation of the XRF results and the analysis of the ‘toki’ characteristics (shape, dimensions), combined with surface archaeological evidence (e.g. mining pits, associated debitage), will allow a precise identification of the raw material sources and provide useful information about the extraction and manufacturing processes of these tools and the organization of their distribution. Figure 5: Analysis of basalt fragments embedded in the volcanic tuff and basalt outcrops with the portable XRF (photographs by CAP). Bahamondez M. and Valenzuela P., 2004. Conservaciόn de los moai del Ahu Tongariki, Centro Nacional de Conservaciόn y Restauraciόn / DIBAM, Report, 19 p.
Baker P.E. , Buckley F. and Holland J.J., 1974. Petrology and Geochemistry of Easter Island, Contr. Mineral. and Petrol., 44, 85-100. Baker P.E, 1993. Archaeological stone from Easter Island, Geoarchaeology: An International Journal, 8, 2, 127-139. Roth M., 1990. The Conservation of the Moai ‘’Hanga Kio’e’’ : Methods and Consequences of the Restoration, Courier Forsch.-Inst. Senckenberg, 125, 183-188. Van Tilburg J.A. and Arévalo Pakarati C., 2010. 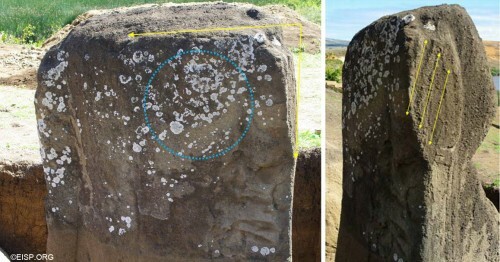 Preliminary Report: Phase 2 Excavation Field Season, 15 October to 22 November 2010, Easter Island Statue Project Conservation Initiative. Vezzoli L. and Acocella V., 2009. Easter Island, SE Pacific: An end-member type of hotspot volcanism, GSA Bulletin, 121, 5/6, 869–886.